After a short dialog with Wally - you will be in Mauville City. Head east to Route 118 and use Surf to travel across the small body of water. Shortly after continuing along the path - Steven will appear and take you to Southern Island. Head north to find Latias and a dialog will appear with Team Aqua. Say, "I'm not moving!" and prepare for battle with Team Aqua Grunt and Aqua Admin Matt. 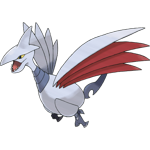 After the battle - Latias will join your team and Steven gives you the Mega Bracelet. Back on Route 118 - head east and continue until you reach the sign. Take the path north to Route 119. Continue traveling north on Route 119 until you reach the Weather Institute. Head to the second floor for a dialog with Team Aqua and the researchers. Head towards the scene and battle the trainers along the way. Once you reach them - prepare to battle with Aqua Admin Shelly after a short dialog. After the battle - the head of the Weather Institute gives you a lvl 30 Castform. Exit the Weather Institute and head east across the bridge. Shortly after - Brendan/May will appear and challenge you to a battle. Defeat Brendan/May and he will give you the HM02 Fly. Continue north to find Fortree City. Travel through the city using the southern rope bridge and you will eventually come across Steven. Follow him out of the city to the east to find Route 120. Follow Route 120 until you fin Steven on the bridge. After a short dialog - a lvl 30 Kacleon attacks, which should be caught as it may help out later. After the battle - Steven gives you the Devon Scope and Blazikenite. Head back to Fortree City and go cross the northern rope bridge. Climb down the center ladder and use the Devon Scope on the invisible obstacle. Continue to the Fortree Gym and enter it. Head east and go north. Go around the obstacle and push the wooden one east. Go back around and go south this time. Now head west and go north through the wooden obstacle. Continue north and now go all the way east. Head north and go south - pushing the center wooden obstacle south. Head back around and this time go west through the opened path. Head north up the stairs and prepare to battle the Fortree Gym Leader. Fortree Gym is lead by Leader Winona, who specializes in Flying-type Pokémon. To navigate the gym you'll need to find a path through the one-way barriers that change direction when you walk through them. Most of Winona's Pokémon have a weakness to Electric-types, so a strong Manectric or Plusle/Minun should make quick work of her first three Pokémon. 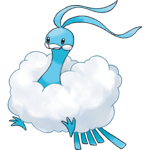 Her Altaria is also part Dragon-type and knows Earthquake, which is capable of massive damage to Electric-types. For this reason, it's also recommended you bring a strong Rock type to finish Winona off. Keep in mind that she will be using Potions to heal. 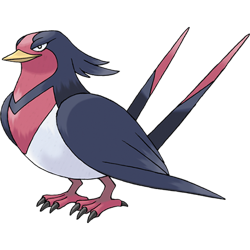 Your reward for defeating Winona will be the Feather Badge and TM19 - Roost. 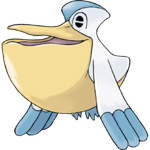 With the Feather Badge you'll be able to use Fly outside of battle and Pokémon up to Level 70 will obey you.